Aside from that Rockies set, and its tweaks, I haven't done much in the way of concepts lately. Memorial Day, for instance, snuck up on me. In any event, every season since I've joined the WAFA, I've rolled out a patriotic jumper for Memorial Day and the 4th of July (the former day is largely because ironically like the Cubs, the Robins tend to be on the road on 4th weekend, so I usually push for a Memorial Day weekend home game to compensate). Though I'm considering breaking the pattern next season, the first seven were mainly teal, and so is #8. Like I said, Memorial Day snuck up on me. I considered a few other ideas before settling on a flag-like variation of the Robins' usual wings. I have a couple more ready to go, I just need to ad em up: a rather different-looking Geelong, and Queanbeyan from the ACT (Australian Capital Territory)...all I'll say for now is you might find what I've done to Geelong's hoops weird, and that one could say the direction I went with Queanbeyan's home is what I wish Richmond's clash resembled instead of the train wreck it is. Yay! 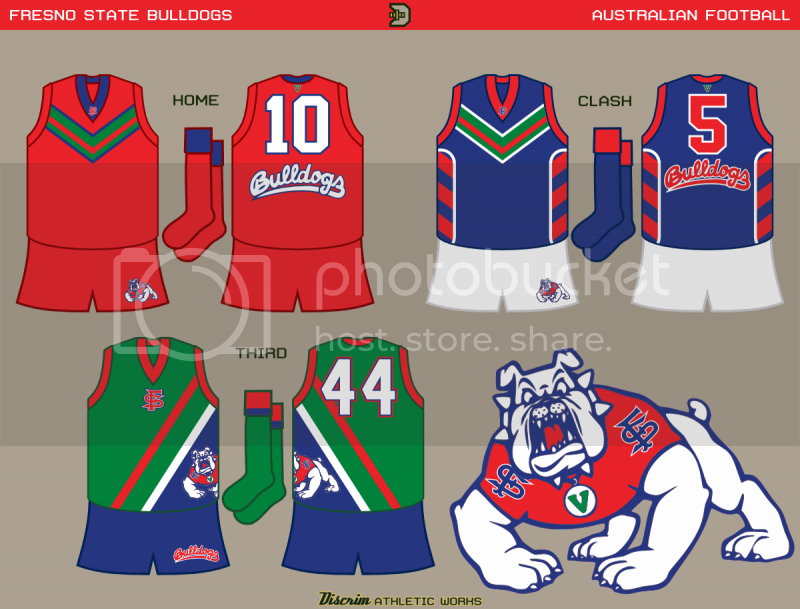 Footy concepts are back!!!! Geelong...bear with me, admittedly this is one of the weirder ideas I've had. Anyway, here goes nothin. Basically, if Richmond's clash resembled this in any way, calling it an improvement wouldn't do it justice. Hell, far as I know, they don't even have Essendon's excuse to fall back on. Anyways, I'd recalled seeing an older pic of Queanbeyan in action years back, and took inspiration from that. The clash...might be overkill, but you won't know if a tiger striped sash will work til you try. Lastly, in honor of the aforementioned Combine, a heritage one off. 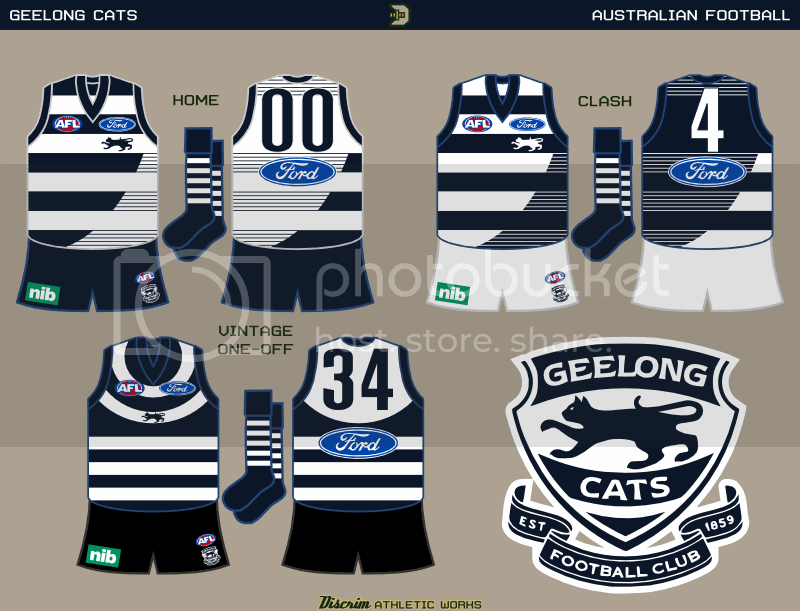 I don't follow Aussie Rules, and I barely recognize any of the AFL teams, but Geelong might be my favorite. Any team that can look good using a house cat as their mascot is a win for me. Well, speaking from experience, house cats do whatever the hell they want. Hell, stray cats tend to do whatever the hell they want (I frequently see the neighbor's cat in my yard, there used to be a huge white stray there every now and then, and a few summers ago there was another stray that would hang around the front porch and meow incessantly). House cats don't care. Here goes nothin...not one, not two, but FIVE new sets! When I've done Michigan in the past, I've simply gone the Carlton route and slapped a big M on the front and called it a day. This time, I decided the blues should mimic the famous helmet somehow, so here it's a simple merger of stripes and a vee. The clash design is based on the costume of one of the lesser known Green Lanterns, Guy Gardner. Why? He's a fictional Michigan alum, of course. 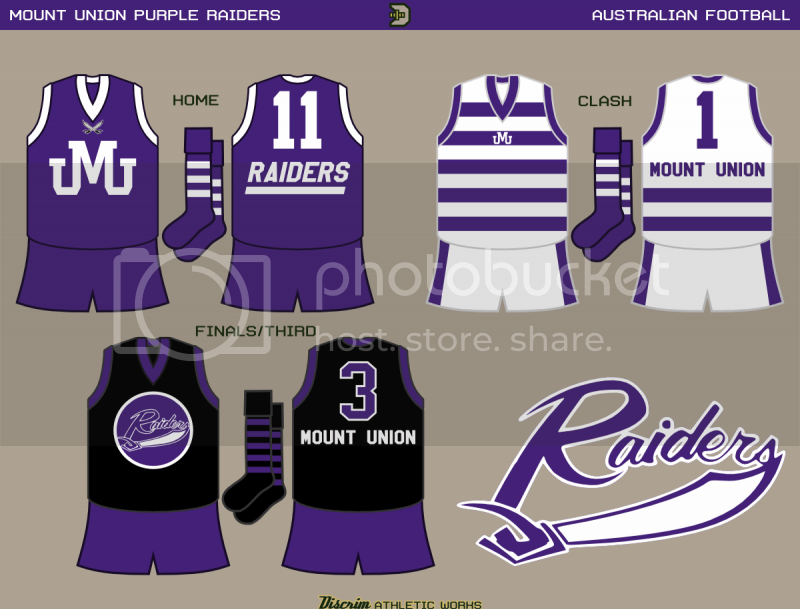 Finally, a fauxback based on the Under the Lights uniform, complete with the older M and printed laces. Honestly, I could've just as easily gone with stripes instead of hoops for the home, but it is what it is. The two clashes have a broad wraparound stripe and use a cutout Bucky on the front. 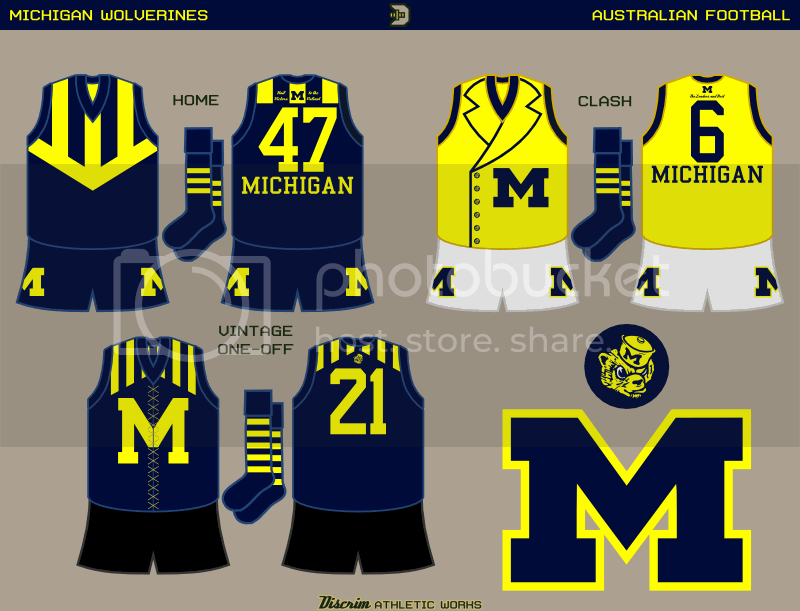 The home and clash use the same design I'd used for Notre Dame's green jumper. 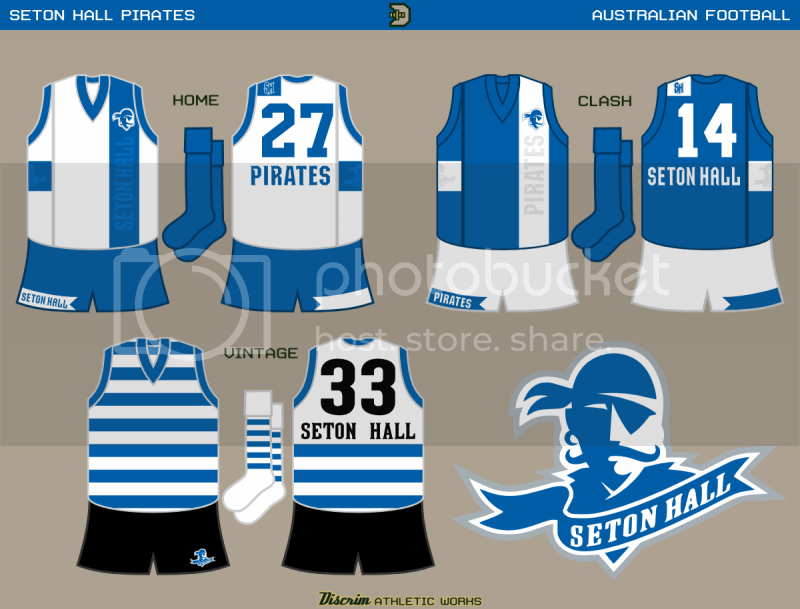 An old St. Kilda design, WWI era IIRC, inspired the third. 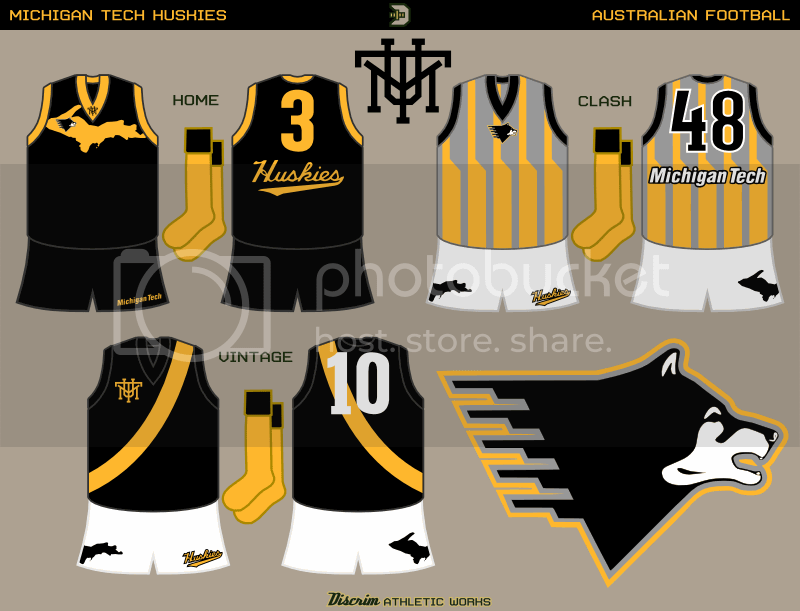 The home jumper...I was originally gonna have a chest panel stylized to resemble Upper Michigan, where MTU is located. Then I said screw that and went with an actual map. The clash...see those bits on the back of the husky logo? Yeh, they've given it the nickname "Piano Dog." I thought stripes resembling them would look at least somewhat okay, so here you go. 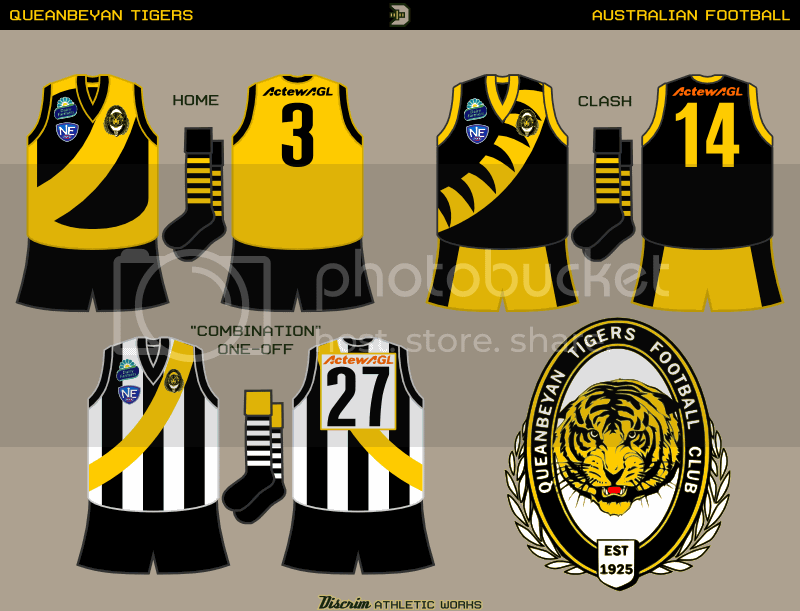 The third...honestly, I could've seen Richmond donating a set of old jumpers to a program trying to get on its feet, if I were inclined to create a faux alternate history. An old friend of mine played basketball for the Jaguars, his number's on the gold/white. 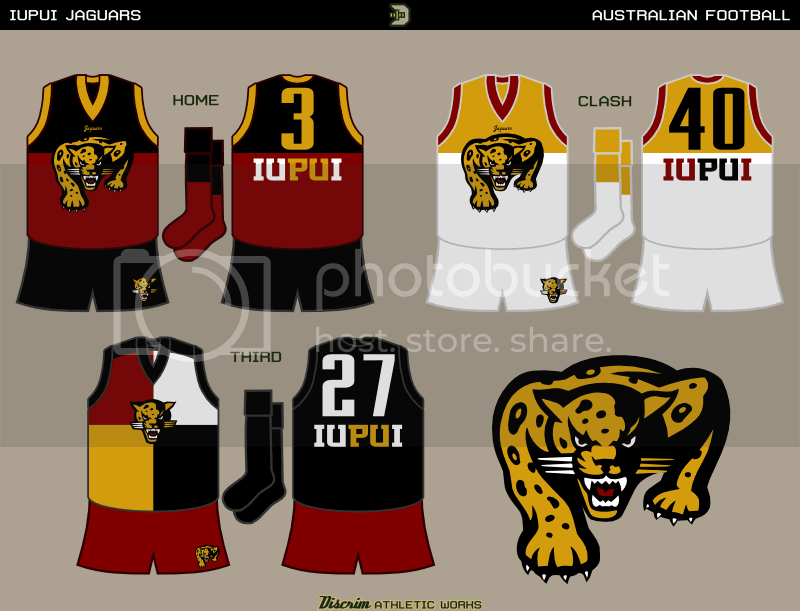 Overall, the home and clash are based on the classic Fitzroy/Brisbane design, the home being black and crimson, the clash being gold and white. The third seemed like a good place to sneak in a harlequin jumper for the hell of it. Your two rusted Lincolns are welcome here! My favorite out of these might be either the Jaguars' harlequin design or Michigan's Guy Gardner look, even though I'm not sure how many fans would catch the reference. Also the badger on Wisconsin's set doesn't look too great to me, cut off like that. It's been a long time, and this has actually been done for a few weeks. 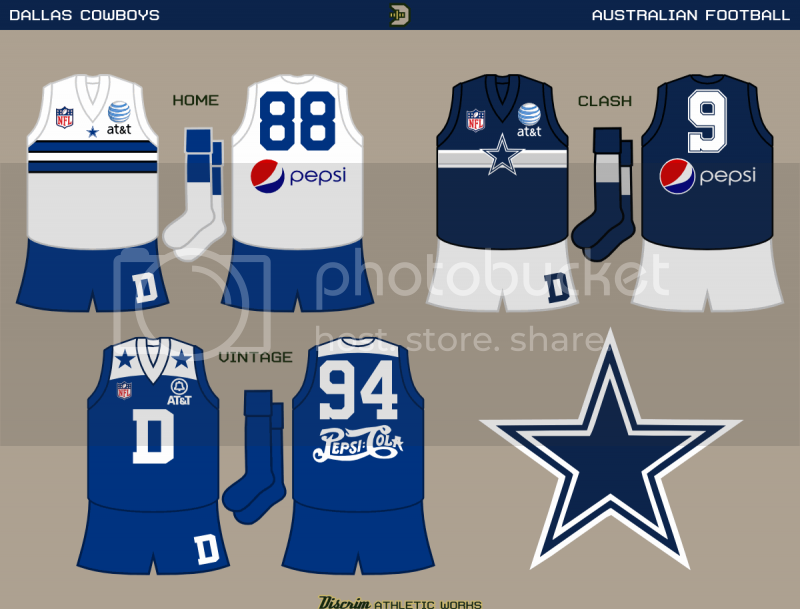 If you ever wanted to see a Dallas Cowboys jumper set, you can die happy now. Nice series thus far. 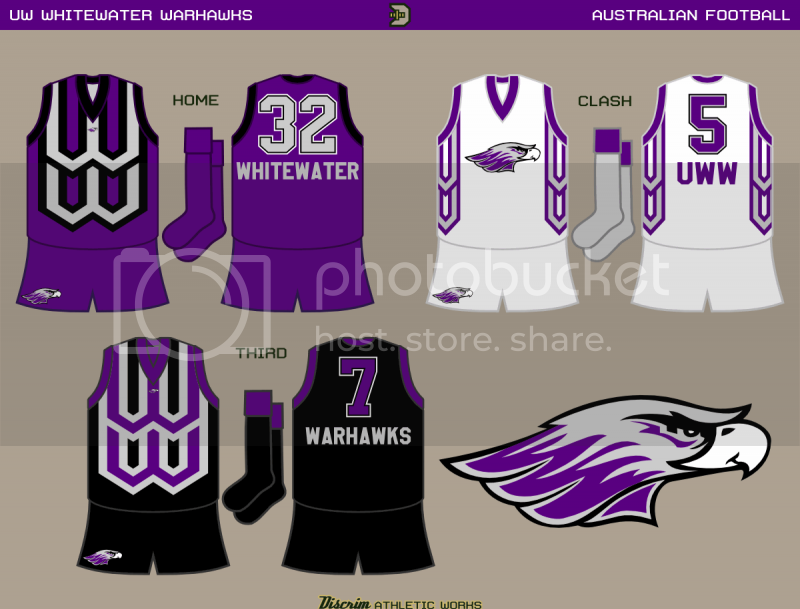 Any thought if doing some Minnesota-themed jumpers? The idea of a double W motif popped in my head, and for the purples and blacks, I used it in a manner similar to stripes, while for the clash, I decided to go with using it as side panels. For Mount, I went with a basic monogram jumper for the first choice, and hoops for the second choice (for those wondering if this gets handled like soccer, not really. The white back is considered a sufficient clash). The monogram itself, I'd actually cobbled together for my current sig, and I've no idea if Mount actually uses anything similar to it. Third choice is based on the black jerseys UMU football frequently wear in the postseason. The home's based on the West Coast Eagles' wings, naturally, while the clash is basically an inverted Melbourne, with the added bonus of resembling a cardinal's face somewhat. 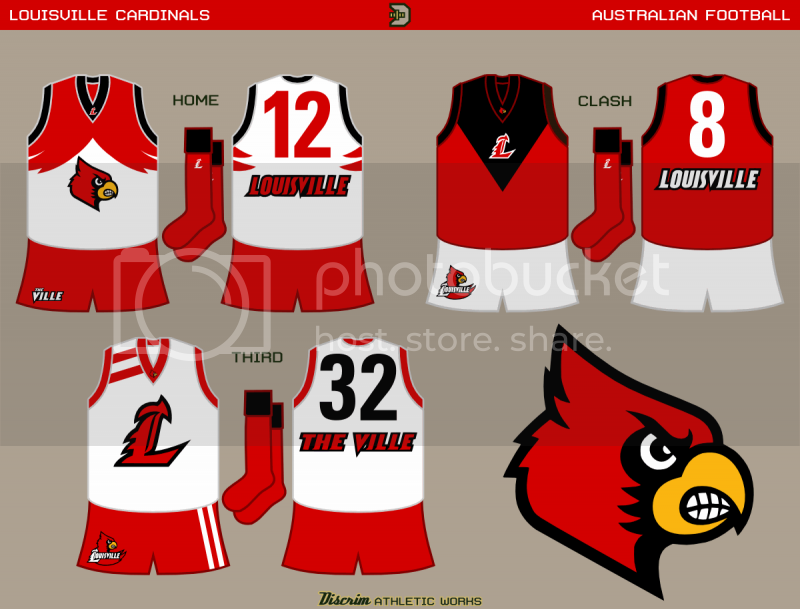 The one-off is loosely based on the sweater worn by the old dunking cardinal...true, that had a block L and sleeves, but same principles. While checking out Historical Futbol Kits a few days ago, I noticed a number of English clubs sporting their own variations on a rather nice Nike shirt. The home and clash are based on that, with a tweak or two. The lettering on the front is meant to be akin to shadow stripes, i.e. only really visible when the light hits right, unobtrusive. The third, well, you aint a pirate without hoops, am I right? 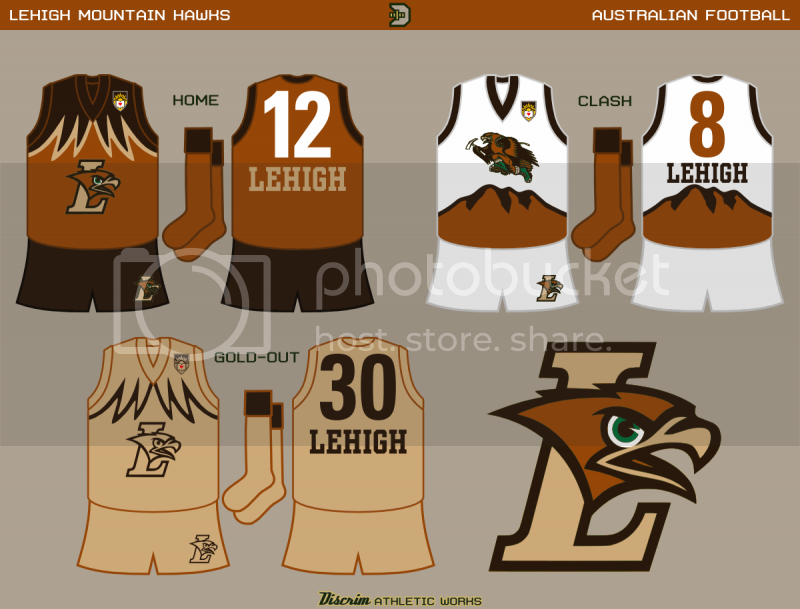 The home...well, St, Pauli's made two-tone brown work, why not Lehigh? The clash, if it vaguely reminds you of a hockey jersey, then I've largely succeeded. For :censored:s and giggles, I bring you a goldout for the third. 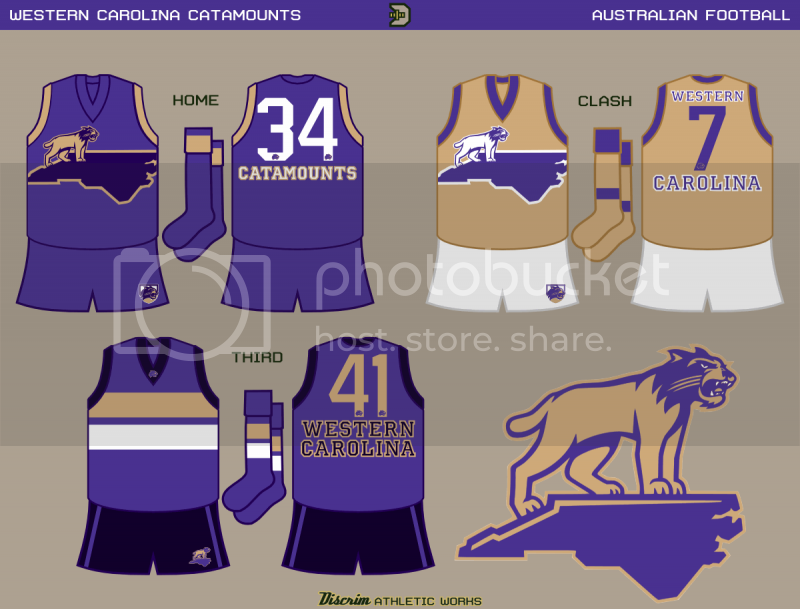 Purple/gold at home, white/gold for clash, hoops all the way. The third is based on the old strutting pirate. 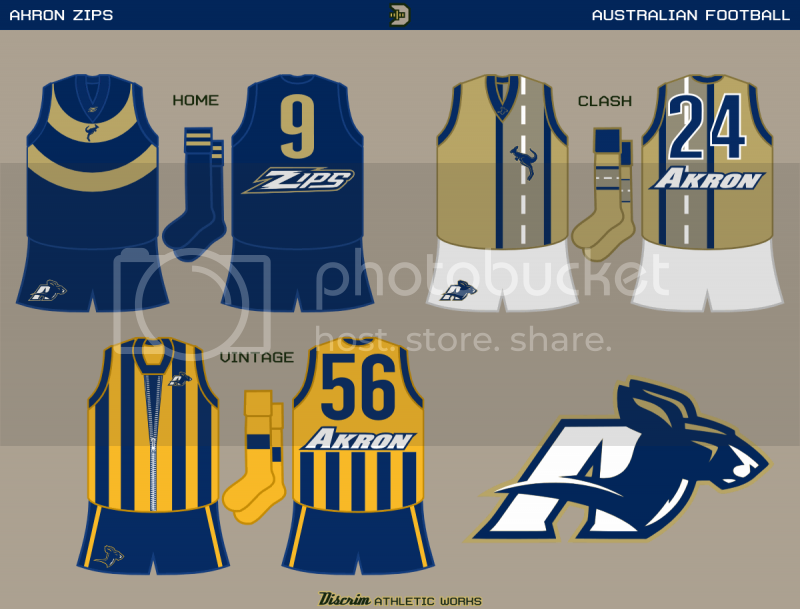 The home jumper's circular gold rings represent a tire, given Akron's historical association with rubber in general, and Goodyear tires in particular. As tires are usually foundon motor vehicles, I figured the clash would be a good time to cause one to wonder about roos crossing roads. For a fauxback, I'd initially had a simple blue/yellow striped jumper. Then, remembering that Zips was originally short for Zippers, I thought about redoing it, but making a good zipper design would be a mother. In typical fashion for me, I discovered thhat zips football had already had a similar idea...granted, I only found out half a day ago, WELL after the season's over, but still. May as well use their existing helmet zipper....and that's the end of that. Time aint on my side due to technical issues, so I'll keep it short: white w/gold sash, honeycombs, and a fauxback based on 1890s footy. I'll probably have more words for ya later on. Really nice series, hope you keep up the good work! Thanks mamiller and lancelot...for Akron, yeah, it's a printed zipper...if not for my own impatience, I probably would've tried my hand at working it into an actual zipper, but seeing as zipper-front baseball jerseys nowadays are mainly museum pieces alongside leather helmets, belted basketball shorts and laced jumpers, it is what it is. 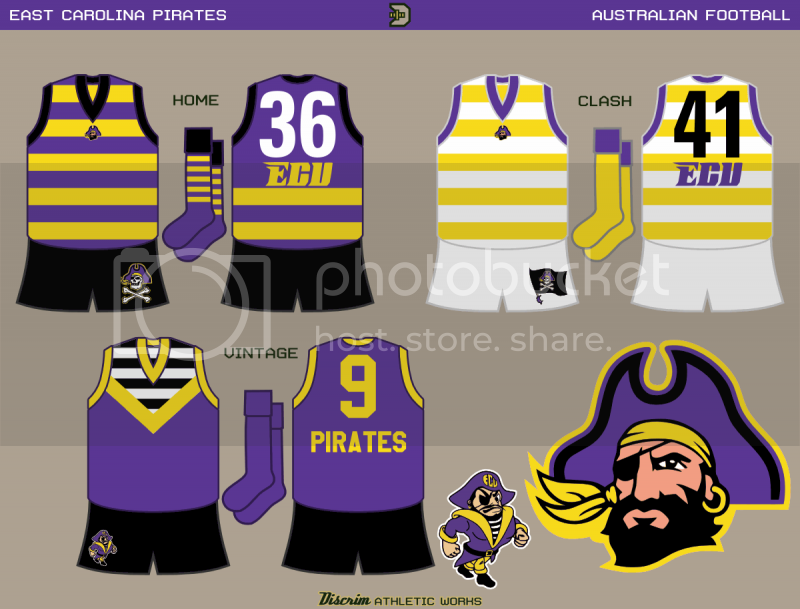 Tech, the last time I did em the home was white with the gold sash, I figured why screw around with a good thing? 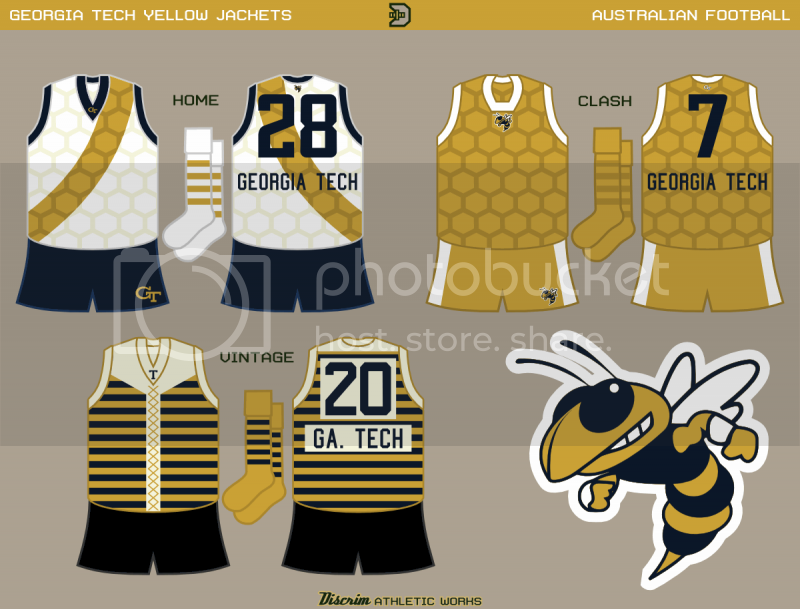 Can't remember what else I considered for the clash, but the RL result would likely be somewhat more subtle in practice, what with the use of a slightly darker gold, rather than either white or blue for the hive lining. The fauxback, yeh, that was the one I put most of my thought in...I couldn't see myself completely forgoing hoops here, so it was a dash of the thin hoops that were popular in 1880s-1890s English soccer (though mine are admittedly a tad beefier than theirs, but thinner than modern hoops), a hint of Fitzroy from the same era with the chamois reinforcing, and a numberplate to round it all off. Nowadays, SBU uses a more nondescript SB monogram more often than anything else, but I'd liked the wave/wolf for a while now, and finally got around to using it. 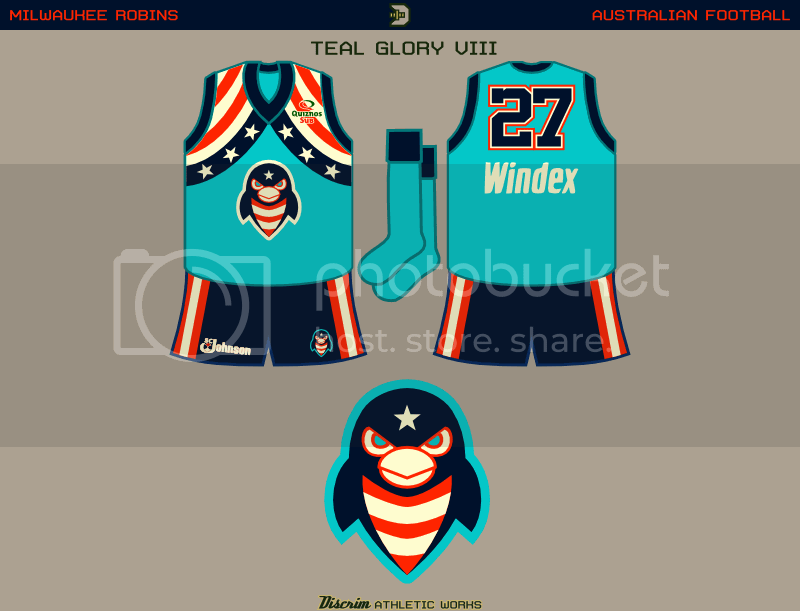 Both jumpers have a wave theme, somewhat similar to Gold Coast, though not as detailed, admittedly. WCU used to have one of those identites that seemed to be trying too hard. At what, I still wonder in a car wreck kind of way. So I was a bit late to the party in finding out about their upgrade. The big cat standing atop North Carolina seemed like something I could center a jumper around, so with a slight modification, that's what I did. Western Footscray's design is the basis for the third, simply because it's one of my personal favorites. If UT had a footy squad, their first choice would more than likely look something like this. Aside from the longhorn, burnt orange from neck to toe. Burnt orange braces adorn the clash white, while the fauxback here, like GT's, borrows from the 1890s, off white with cowboy shirt-style reinforcing, and the added touch of a pocket on the chest, an idea I got from the 1900s St. Louis Browns. 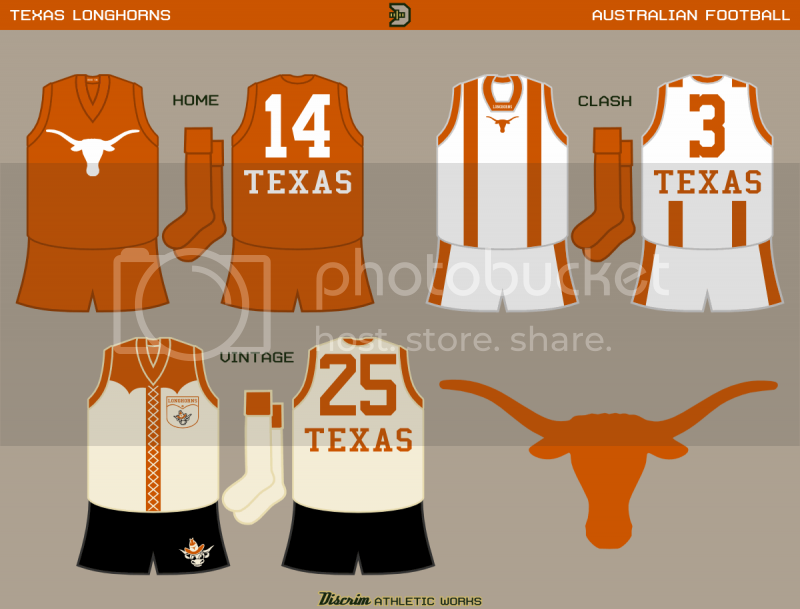 I've said it before many times, and I'll say it again: your unique design style translates so well to Aussie Rules, it's almost scary. 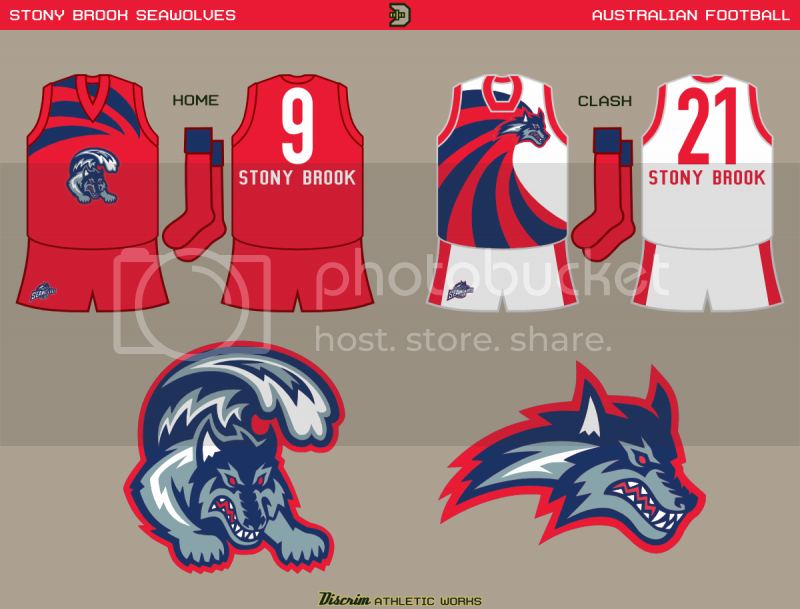 The pattern on the Stony Brook jumpers is eye-catching, and I also love the use of green for your Fresno State concept in particular. 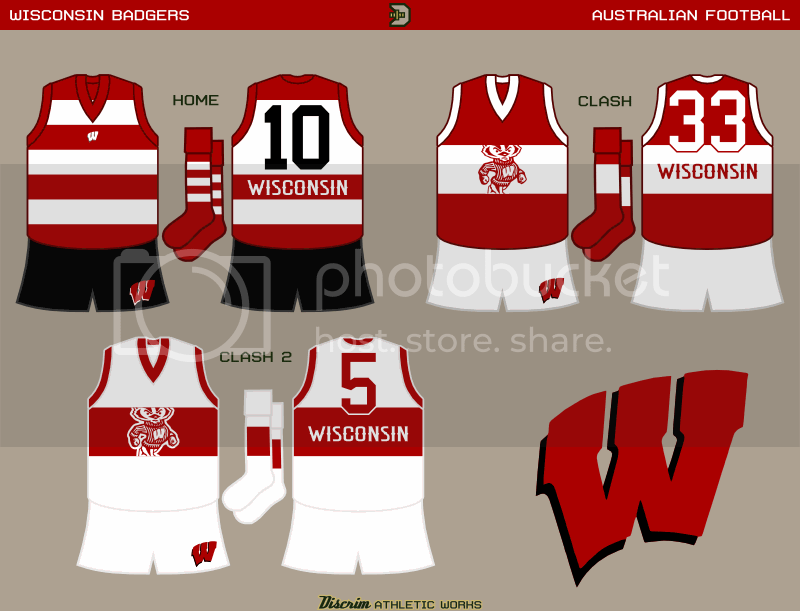 The only thing so far that I take issue with is the Wisconsin home kit. To me, black should always be used very sparingly for Wisconsin, both to differentiate it from Nebraska and not make it look like Ohio State (the red on top and black on bottom reminds me a bit of OSU's hockey uniforms). 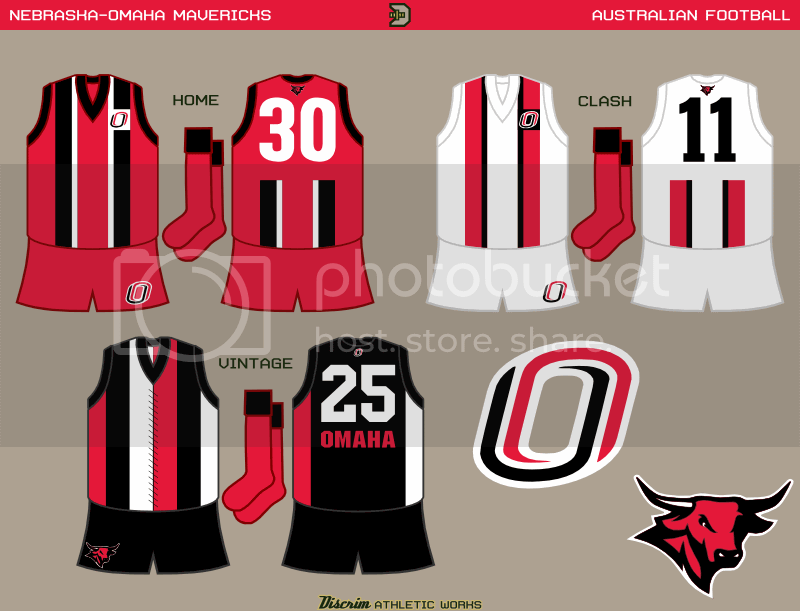 I'd try changing the home shorts to red if you want to maintain a home/clash relationship between the kits. 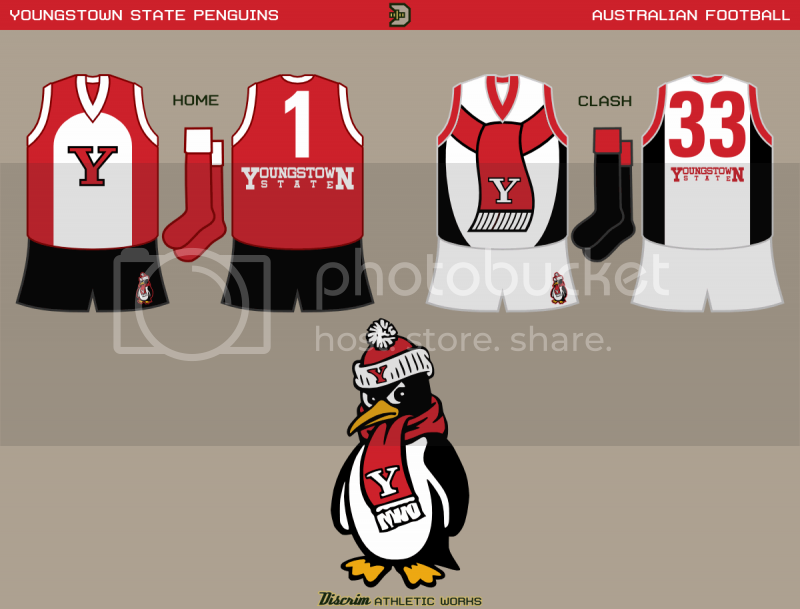 Decided to forgo a third here, so I only have the first choice of red with a white penguin stripe, and black with a penguin stripe + a red scarf. I know one thing, for the young'uns around here, I got a few fond memories of when Youngstown and Marshall were battling for the 1-AA championship in the mid 90s, which ended when the Pens' level kinda fell off and Marshall moved to 1-A.